HÀ NỘI — Doctors from the Việt Nam – Germany Hospital has conducted the country’s first successful surgery on a female patient with the HIV virus who was suffering from type A aortic dissection. “The surgical team overcame their limitations when conducting the surgery for the patient, “said Associate Professor Nguyễn Hữu Ước, head of the hospital’s Cardiovascular and Thoracic Surgery Department and also head of the surgical team. Ước said that he had conducted surgeries on other HIV patients but most of them suffered from less serious diseases, so their surgeries required less time than the eight-hour procedure, meaning the surgical team and post-surgery caretakers were at risk from the HIV virus for a shorter period. 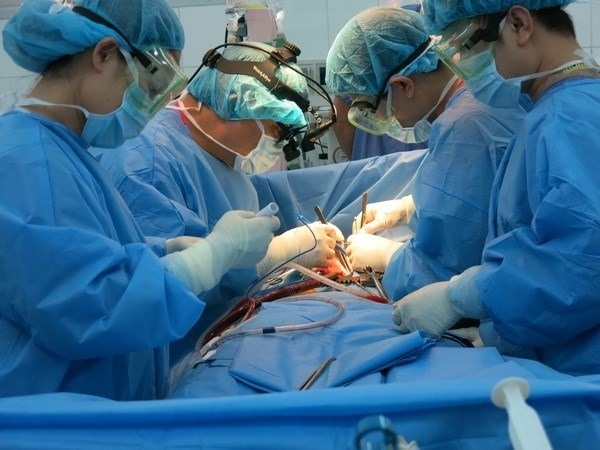 “A normal surgery requires a surgery team of five to seven but the surgery for type A aortic dissection was conducted by a team of 12 people and lasted eight hours,” Ước said, adding that they faced higher risk of exposure to HIV due to the time-consuming surgery. Preparation for the surgery had to be made carefully, with many disposable medical supplies available. “During the surgery, any move, from holding a surgical knife to doing stitches, must be done exactly and carefully,” he told the Sức khỏe & Đời sống (Health& Life) newspaper. Dr Phạm Tiến Quân, vice head of the hospital’s Resuscitation Department and a member of the surgical team, said that the team faced a risk of HIV exposure during the procedure. Also, an HIV patient would be more vulnerable to bacterial contamination than other patients, he said, adding that the HIV patient required intensive care. Nguyễn Thị Thu Hà, a nurse responsible for caring for the patient after surgery said that the nurses assigned to the case had to review their care scheme. “All waste the patient discharges is treated properly,” she said. Besides medical care, healthcare providers were asked to treat the patient well to avoid discrimination, Hà said. “We are happy if the patient and her family are pleased with what we have done,” she said. Associate Professor Nguyễn Hữu Ước said the patient was hospitalised on May 4. She was infected with the HIV virus in 2005 and began using antiretroviral drugs in 2015. Doctors also diagnosed that she suffered from type-A aortic aneurysm, aortic insufficiency, mitral incompetence and Marfan syndrome. Marfan syndrome is a genetic disorder that affects the body’s connective tissue, with 0.5 per cent of the population suffering from this disease. Patients with Marfan syndrome show pathological symptoms related to the eyes and the musculoskeletal and cardiovascular systems. The HIV patient was diagnosed with type-A aortic dissection, which can be a life-threatening disease, with 3-4 out of every 100,000 people contracting the disease per year, he said. According to colombiasurgery.com – a website of the US’s Columbia University Medical Center, an aortic dissection is a tear in the inner lining of the aorta. This tear allows blood to flow through the walls of the aorta rather than remaining in the central channel. The two main types of aortic dissection, type A and type B, are defined by the location of the tear. In type A, the tear begins in the ascending aorta and progresses throughout the vessel, often extending as far as arteries in the leg. In type B, the tear is located only in the descending aorta, but may extend into the abdomen. Type A requires immediate surgery, to prevent death from stroke, heart attack, congestive heart failure, or bleeding. Type B dissection is considered a medical condition that can be initially treated with aggressive control of blood pressure. Without treatment, only 10 per cent of patients with the disease live more than a year after diagnosis, Ước said. The heart surgery was further complicated as the patient’s immune system was depleted due to the HIV, he said. “Upon receiving the patient, we found that she needed timely surgery or she would die,” Ước said. “We decided to conduct the surgery to save her life,” he said.